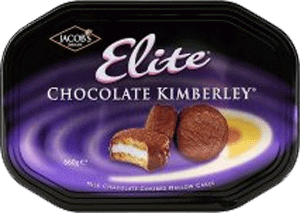 Jacobs is the number one biscuit manufacturer on the Irish Market for assorted biscuits. Traditionally seen as seasonal offerings, Jacob's offers an eclectic mix of assorted biscuits, which cover various eating occasions. 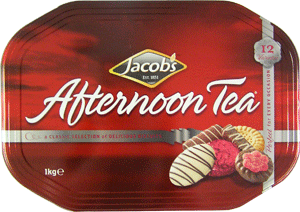 The Jacob's brands most synonymous with this sector of the biscuit market are the classic family favorites Jacob's Afternoon Tea & USA. The Jacob Fruitfield Food Group was created in August 2004 as a result of the amalgamation of Fruitfield Foods - which had been bought out from Nestle in 2002, and Irish Biscuits - purchased from Group Danone in 2004. The Group holds an enviable product portfolio of famous Irish brands and market leaders. Individually the historical path of both Jacobs and Fruitfield Foods extends over 150 years. For generations, Irish people have supported and embraced the broad range of brands within both companies and it is the ambition of the Jacob Fruitfield Food Group to sustain and grow these brands for many generations to come. Soft biscuit topped with a tangy orange jam and covered with plain milk Chocolate. Jacobs Famous Club Milk cookie covered in Chocolate. First launched in 1901 Jacob's Club Milk celebrated its centenary in 2001. Since its introduction Jacob's Club Milk has been one of the best loved biscuit bars in Ireland. Soft biscuits filled with white mallow and covered lightly sprinkled with sugar. Classic, traditional recipe plain biscuits. Soft biscuits filled with white mallow and covered with milk Chocolate. McVitie's Milk Chocolate Hob Nobs are milk chocolate covered oatmeal cookies. Low in salt, with no artificial flavors or colors, these can be enjoyed as a part of a healthy diet. The McVitie's name means a better biscuit. McVitie's Cafe Noir are crisp, crunchy biscuits with a unique coffee icing. McVitie's is passionate about baking and generations have loved the great taste of their biscuits. Low in salt, Cafe Noir can be enjoyed as part of a healthy diet and lifestyle. McVitie's biscuits have been enjoyed by generations for over 100 years. The first ever digestive biscuit was created by a new young employee, Alexander Grant. The name Digestive was derived from its high content of baking soda as an aid to food digestion. Offered for your enjoyment are Royal Edinburgh Shortbread Assortment biscuits. Shortbread has been made in Scotland for over three centuries from recipes handed down through the generations. Made in Edinburgh using a traditional recipe and only the finest natural ingredients, Royal Edinburgh is slow-baked to create a melt-in-your mouth, full butter flavor. Soft biscuits topped with white and pink mallow and sprinkled with coconut. Cookie Fingers covered in Cadburys milk chocolate. 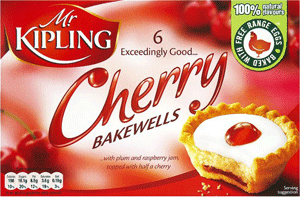 The Mr. Kipling brand name comes from an Irish baker, Mr. Seamus Kipling who lived in London. Mr. Kipling is a brand of cakes, pies and baked goods widely marketed in the United Kingdom and Ireland. The trademark is owned by RHM (Rank Hovis McDougal), Tallaght, Dublin, Ireland, and they are made in Barnsley, South Yorkshire, UK. In 1967, at a time when cakes were more often bought from local bakers, the company introduced cakes of a local baker's standard to supermarkets. With advertising featuring the phrase "exceedingly good cakes", the company had become the brand leader in the UK by 1976, a position it still holds 31 years later. Since then, the company has also marketed varieties of single-serving and individually wrapped cakes. Mr. Kipling Cherry Bakewells are pastry cases with a layer of raspberry flavored plum jam and almond flavored cake, topped with fondant icing and a half cherry. They contain no artificial flavors or colors but they do contain nuts. Fruit Brack is a delicious fruit bread lightly sweet with raisins, candied citrus peel, currants, sultanas, and other bits of dried fruit.